Custom knives will be one of a kind knives made by knife makers in Scandinavia. All of the work is hand done on each knife. When these are available, photos will be posted along with the price of each knife and a description of that knife. Once the knife sells there will not be another one like it on the site. Below is a photo of one of the knives that will appear soon on the website. This is a custom made Sami puukko by Pasi Jaakonaho from Finland. 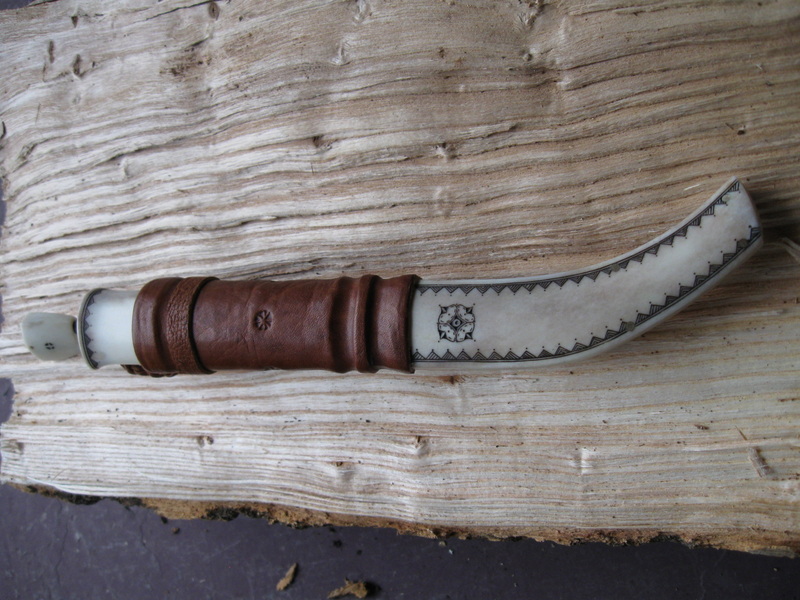 This knife is made from reindeer antler, tanned reindeer hide and a carbon steel, hand forged blade. Pasi also does all the scrim designs on the sheath and handle . He made this knife in the late fall of 2014. 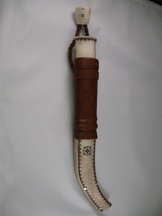 The knife is made to be used in the bush but most buyers of this style of knife are collectors of custom Finnish knives. It is truly a piece of art in the knife world. For the collector or the outdoors person who wants a unique knife, this is a one of a kind knife made by one of Finland's premier knife makers. 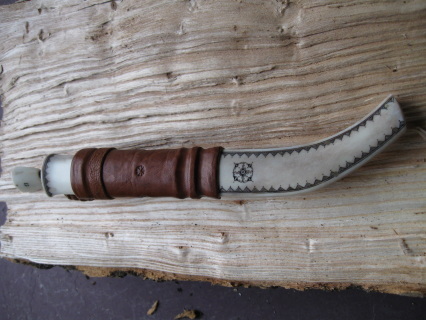 This is a larger custom made Finnish leuku made by Kay Vikstrom, Lilby, Finland. It is a unique leuku because it has a smaller convex grind on the blade instead of the most common scandi grind. Kay made this more for chopping and as a kitchen knife where you would use it for chopping more than cutting. The custom made sheath has a Tommi knife design with the lower 2/3rds a dark red color in the center and dark brown on the rest of the sheath. He stitched it with the Swedish style in the back. This style has very tiny stitches and they are placed on the far left side in the back. It also has a Swedish style hanger on the sheath. This was the 1029 knife that Kay made and that number is stamped in the back of the sheath below the hanger. The blade is hand forged out of 1085 carbon steel. The blade is partly polished so you can still see some of the black carbon color and see some of the hammer marks left on the blade. The blade is hardened to HRC 56-58 so it holds a good edge but can still be sharpened easily. The handle is made of masur/curly birch with a linseed oil finish on it. 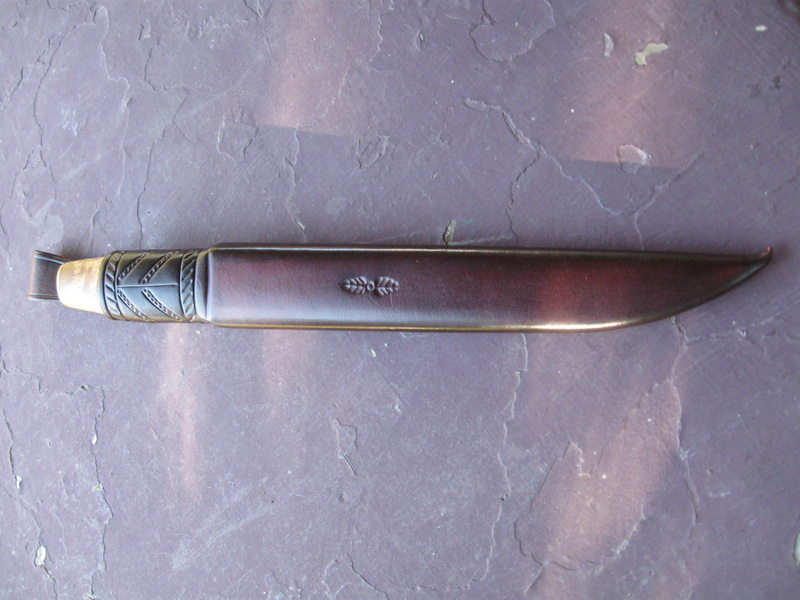 There is a brass bolster and also a brass pommel on this knife handle. If you are looking for a very unique, custom made leuku, this is a great knife to have. It is a one of a kind piece.